‘Vive le Québec libre!’ Who can forget de Gaulle’s mischievous and irresponsible speech in July 1967 during his visit to that hapless province, a catchphrase which has become since then the eternal rallying cry for Western tribalism. And now, joining the ever lengthening queue is Catalonia – the subtext of whose recently called elections is, once again, ‘independence’. The Basques are lurking in the background and the Scots are not even lurking but quietly forging ahead. And there is ‘Padania’ led by the awful Lega Nord in Italy, and the list does not end there. Feeding this frenzy for secession and independence in Europe is the premise that all these new states will somehow find a safe haven as Member States of the European Union. Absent that assumption, appetite for independence would be significantly muted, the rough seas of ‘going it alone’ far more threatening. The Canadian Supreme Court, in its careful and meticulous decision on Quebec the reasoning of which remains valid today, clearly showed that none of these cases enjoy a right of secession under public international law, since all of them enjoy extensive individual and collective liberties enabling the full vindication of their national and/or cultural identity within their respective states. But the issue is not one of rights, of law. It is simply ethically demoralizing to see the likes of Catalonia reverting to an early 20th-century post-World War I mentality, when the notion that a single state could encompass more than one nationality seemed impossible – hence the special treaties on minorities which abounded in the break-up of the Ottoman and the Austro-Hungarian Empires. These arrangements were well-intentioned but lacking in political imagination and eventually, let us not hide the ugly facts, feeding and leading to that poisonous logic of national purity and ethnic cleansing. Make no mistake, I am not suggesting for one minute that anyone in Catalonia is an ethnic cleanser. But I am suggesting that the ‘go it alone’ mentality is associated with that kind of mindset. Yes, Catalans and Basques suffered serious historical wrongs in the pre-democracy era in Spain. And I have huge, truly huge, empathy and sympathy for Catalans who want to live and vindicate their cultural and distinct political identity. For thousands, maybe the majority, this is really all it is about. But to play the ‘Franco card’ as a justification for secession is but a fig leaf for seriously misdirected social and economic egoism, cultural and national hubris and the naked ambition of local politicians. It also runs diametrically contrary to the historical ethos of European integration. The commanding moral authority of the Founding Fathers of European integration – Schumann, Adenauer, de Gaspari and Jean Monnet himself – was a result of their rootedness in the Christian ethic of forgiveness coupled with an enlightened political wisdom which understood that it is better to look forward to a future of reconciliation and integration rather than wallow in a past, which, notably, was infinitely worse than the worst excesses of the execrable Franco. It is sometimes said that the principles of democracy and self-determination require decision by referendum. But this of course begs the question of who is the ‘political self’ that has the right to determine whether or not the historical nation – even if composed of several peoples – will be broken up and secession allowed. Do we allow every distinct national, cultural and linguistic ‘minority’ in Europe to hold a referendum about secession and independence? The Corsicans? the Bretons? The Welsh? The German speakers of the Alto Adige? The list is endless, given the wonderful cultural richness of Europe. Why should it not be the French as a whole, or the British as a whole, or the Italians as a whole who get to decide the future of their state? Why should it be the Catalans rather than, perhaps, all citizens of Spain who get to decide about the breakup of the Kingdom? There is no self-evident answer to this question. I would argue that it is only under conditions of political and cultural veritable repression that a case for regional referenda can convincingly be made. With its extensive (even if deeply flawed) Statute of Autonomy it is simply laughable and impossible to take seriously Catalan arguments for independence, arguments which cheapen and insult meritorious – if inconclusive – cases such as that of the Chechens. The European Union is struggling today with a decisional structure which is already overloaded with 27 Member States, but more importantly with a socio-political reality which makes it difficult to persuade a Dutch or a Finn or a German that they have a human and economic stake in the welfare of a Greek or a Portuguese, or, yes, a Spaniard. Why would there be an interest in taking into the Union a polity such as an independent Catalonia predicated on such a regressive and outmoded nationalist ethos which apparently cannot stomach the discipline of loyalty and solidarity that one would expect it owed to its fellow citizens in Spain? The very demand for independence from Spain, an independence from the need to work out political, social, cultural and economic differences within the Spanish polity, independence from the need to work through and transcend history, disqualifies morally and politically Catalonia and the likes as future Member States of the European Union. Europe should not seem like a Nirvana for that form of irredentist Euro-tribalism which contradicts the deep values and needs of the Union. The assumption of automatic membership in the Union should be decisively squelched by the countries from whom secession is threatened and if their leaders, for internal political reasons, lack the courage so to say, by other Member States of the Union, France in the lead. It would be hugely ironic if the prospect of membership in the Union ended up providing an incentive for an ethos of political disintegration. There really is a fundamental difference in the welcoming into the Union of a Spain or a Portugal or a Greece emerging from ugly and repressive dictatorships and a Catalonia, part of a functioning democracy which at this very moment is in need of the deepest expression of internal and external solidarity. In seeking separation, Catalonia would be betraying the very ideals of solidarity and human integration for which Europe stands. I hope it never comes to it, but the only merit in a Catalonian referendum would be to allow the Catalans to have the good sense decisively to reject the proposal. If there is a referendum all Europeans should hope that that is what they will do. And if they do not – well, let us wish them a Bon Voyage in their separatist destiny. I totally agree with you when you say that the Catalans have no right to independence under international law, but apart from that your analysis of the reasons why the Catalans (and this is valid for the Scots and others as well) would like to get independence is quite superficial and morally charged. For reasons of scope, I will only focus on the Catalans. First, the memory of Franco’s dictatorship is not, today, an argument for independence. What they point to is rather a democratic deficit. First, all began when the Spanish Consitutional Court stroke down some clauses of the new statute of autonomy voted by the Catalan Parliament, especially the ones where they declared Catalan to be the senior language in the region (although Spanish would have remained an official one as well) and where they asserted that Catalonia is a nation. Did the Catalans have a right to see those clauses approved? Well, when it comes to language, there are plenty of European regions where the state language is the junior one (although officially still an official one), so why shouldn’t the Catalans have a right to that. As for the demand to be recognised as a nation, what the Court suggested is that the Catalans may well think that they are a nation, but this doesn’t have any legal consequences. Therefore, they implicitly, but quite clearly, stated that there is only one nation, the Spanish one, and maybe some nationalities (but endowed with inferior status). Secondly, Catalan nationalists claim that Catalonia sees between 8 and 10% of their GDP go to other regions and argue that in a moment of serious economic distress, as the current one, those resources should be, at least in part, used to prop up the welfare of the Catalans. Is this selfish? Probably, but it is true as well that according to some calculations Catalonia is the 4th richest region in terms of GDP, but when one looks at households’ disposable income it ranks 9th and has seen its purchasing power substantially declining in the last years. So, in fact, what they’re arguing is that if Catalonia ranks 4th in the production of wealth it shouldn’t fall as back as 9th in the enjoyment of that wealth. Maybe if it ranked 5th or 6th, secessionism wouldn’t be so strong in the region (Convergencia y Union decided to campaign for a referendum on independence after that the Spanish government rejected the Catalan proposition for a renegotiation of the fiscal pact between Barcelona and Madrid). Finally, and more fundamentally, the backward 19th century-like mentality that you criticise so much is no different from the nationalism of the Spanish state. The simple difference is that the Spanish one is “banal nationalism”, while the Catalan one is “stateless nationalism”. Spain has got democratic – let’s hope not but need be also military – institutions to enforce it, Catalonia has got some institutions but thinks that they are not enough, so it would like to have full, or nearly full, sovereignty. The Catalans never declared that the Spanish people in Catalonia don’t have a right to speak their language and defend their culture, they just asked their equal status as a nation to be recognised, which the Consitutional Court precisely denied. Both the Catalan and the Spanish attitude smell like nationalism to me and I don’t see much difference between the two of them in terms of moral righteousness. The difference lies in the fact that independence is unlikely to be the solution. But if there is somebody who has in practice denied that a state can be plurinational (meaning made up of nations with a status of equal partners) this is precisely the Spanish Constitutional Court. Before June 28, 2010, there was no majority for independence in Catalonia. It began all then. Any analysis that doesn’t take this into account doesn’t serve the cause of collaboration and peaceful coexistence between nations. Thank your for excellent comment. So pedagogic that we Spaniards would benefit from the publication of a translated version in a Spanish newspaper… or even better, in a Catalonian one. Unfortunately, the latter option seems hardly feasible. thank you for this, as always, brilliant comment! Mr Weiler will have no trouble finding newspapers in Spain that thrive on a recipe of portraying Catalans as the “bad guys”. His liberal sprinkling of loaded words throughout his article (I didn’t know that the EJIL’s peer reviewers were so lenient!) bertray a remarkable lack of academic reasoning. How can he possibly describe as an “ever lengthening queue” of stateless nations aspiring to full sovereignty a list which, in the last 25 years, has lost Estonia, Latvia, Lithuania, Slovakia, Croatia, Slovenia, Macedonia, Byelo-Russia, Georgia, Armenia and most recently Montenegro, only in Europe west of the Urals? The belief among Catalans that we would do better by “going it alone” (the “right to decide”) is not a result of the 2010 ruling by the greatly discredited Constitutional Court. In a survey undertaken in 2008 those who said they would vote for independence were 15 points ahead of those who would vote against. A year later the difference was up to 25 points, and since 2011 an outright majority of the population say they would vote for independence. Have the spanish authorities recognised that Spain has a problem? Have they looked at the causes of this unrest? In true colonial fashion they have merely issued threats, thus entrenching and polarising positions. What would you think if hate media against your people, based in the capital, were allowed to build on prejudice? What would you think if the federal minister of education threatened to shatter your school system, carefully built up over a period of 30 years? What would you think if the federal government wasted thousands of millions of Euros on improductive infrastructures, and dragged its feet in your land, precisely because it doesn’t want to invest in a land it’s going to lose? There are ample examples to any objective observer that the post WW1 ideology (much favoured by General Franco, who is lovingly remembered across wide tracts of the Castilian steppes) is still rife in Spanish corridors of power, and that most Catalans are fed up with the lack of autonomy Catalonia enjoys. He or she might even perceive that a free Catalonia has always been the secret, unvoiced dream of many, many Catalans. You’re quite right Elizabeth: it is interesting. The trouble is that the upper limit of federalisation that most Spaniards would accept for Catalonia is, as Prof. Ferran Requejo pointed out, well below the lower limit that most Catalans would accept. But what concerns me most is the way anti-Catalan sentiment has been whipped up for the last 15-20 years by, particularly the Spanish right. Can you imagine dozens of tweets hoping that sir Alex Ferguson (the Manchester United manager), as a Scotsman, will not come through a cancer operation. This has just happened to Barça’s Tito Vilanova. Many Catalans feel not that we don’t have a State, but rather that we have a State against us, that holds up citizens at the airport for saying Good Day to Spanish custom officials, that takes grandmothers to court for refusing to speak to policemen in Spanish… If on top of this, the Spanish government fails to meet its financial committed laid down in the Statute, I’m sure you can understand why “autonomy” is no longer enough for the majority of the population of Catalonia (of which about a half were either born in the rest of Spain or whose parents were). Joseph Weiler’s piece is one of the saddest and most biased articles I remember reading about Catalonia in some time. Does the will of the people not matter in the least to this author? I’m sure that just a few months in Catalonia would iron out the considerable errors and misconceptions that Mr. Weiler is victim to, that is, in my humble opinion. No European in his right senses would put up with Madrid misrule and abusive impositions, such as the Catalans are daily subject to, without raising a considerable rumpus. Range through the extraordinary list of very sound and sensible Catalans and non-Catalans who have come out in favour of independendence, and I’m sure readers will want to see what is behind the slanted adjectives and -often- blatant lack of respect for the Catalan people that underlines Mr. Weiler’s piece. I’m with the Catalans. They have simply been left no other way out than independence, a path dozens of European countries have opted for in the last century. To remain in Spain is death to the Catalan economy, language and culture. Please, anyone needing a better insight, look for the book “What Catalans Want” on Amazon. A great read that makes all fall into place. Isn’t to claim plans for Catalan independence are illegal or that they defy international law a little absurd at this stage of the XXIst Century? Even the quite picturesque way in which Kosovo became independent is being accepted in the international community after The Hague International HR Court approval. Only a short list of countries such as Spain are showing any degree of opposition to this. Nothing (reasonable or civilised) can stop the will of a people to be free. No law can stop it. As Gandhi put it, it is quite legitimate to act against unjust laws. Catalan deserves international recognition and independence albeit for having put up with Spain for so long. The spy that fooled Hitler about the Normandy landings was a Catalan (Joan Pujol). The first European Parliament was Catalan. The photographs that made known to the world the horrors of Matthausen were taken by a Catalan inmate (Francesc Bosch). Isn’t it time to free Catalans from a State that has still not officially annulled the death sentences of the Franco Regime? Or a State that systematically undermines Catalan laws and rights? I think so. 54% Catalans are for independence, 27% against. Is Catalonia to be that part of Europe where the minority rule? In response to some of the comments about alleged abuses of the spanish government against catalan culture and catalan identity, I just wanted to point out that currently the catalan government denies catalan families the right to have their children schooled in spanish language in public schools (Education is managed by regional governments according to the spanish law) regardless of the commented sentence of the spanish constitutional court about the catalan statute. Furthermore civil servants residing and carrying out their duties in Catalonia are required by the spanish law (notice that I am not talking here about the catalan law) to prove proficiency in catalan language via public exams (exactly the same applies for every other region with officially recognised local languages such as Valencia, Balears, Galicia and the Basque Country) having in practice the same weight in the assessment of those very public exams as the technical skills required for the job. The catalan government and in my personal view a significant part of the catalan society regard any suggestion about allowing schooling in spanish, or even an increase of two to three hours a week in the teaching of the spanish language in schools as a form of aggression to the catalan cultural identity. This attitude extends to the private sector in which small businesses have been repeatedly fined by the catalan administration for the sole fact of labelling their shops only in spanish, even after those fines have been dismissed as illegal by different courts. I had to listen myself to the testimony of a catalan acquaintance -a catalan speaker- whose business had received the visit of an inspector from the catalan government warning them about the serious issue of having their catalogue written only in spanish. Having set out these facts I would like to say that in my view and out of personal experience legitimate vindication of cultural identity or self-government is not what catalan nationalism is about. In fact attitudes of nationalistic bigotry are bred inside many families as well as in the schools from infancy. Many catalans grow up thinking of themselves as being part of a superior, more educated, more “european” people in contrast to the people from other regions who are generally scorned. These kind of prejudices are very much alive and quite obvious to everyone having lived for long enough in Catalonia. Then there is the economic resentment; it is common to refer to any relocation of a private company from Catalonia to a neighbouring region as a theft of catalan wealth by the inhabitants of those regions and citizens from poorer southern regions will routinely be accused of stealing catalan taxes. In fact, many catalans seem to be convinced they are the only tax payers in the country. Years ago the decision of the government of Extremadura, the poorest region in the country, of providing a desktop computer per student at every school in the region in order to enhance IT education triggered a wave of indignation amongst the catalan public; most catalans appeared to consider it an injustice commited against catalans whose children didn’t enjoy the same facilities. Of course the conclusion was obvious “Our children lack the computers because their children have them”, no criticism was raised about how the catalan government manages its education funds. My point is that these kind of feelings are actually fueling catalan nationalism today and by the fact that they are shared by significant portions of the catalan public, and any explanation of it based on an alleged conflict motivated by legitimate self-government demands or cultural identity vindications just completely misses the point, since such demands are fully met and even surpassed by current legislation. Neither it is true that catalan and basque nationalism are a consequence of Franco’s authoritarian regime since it is well documented that these political movements have existed from the late XIX century. Great article, I fully agree. One of the problems is the lack of unity among Spanish politicians on this (and other) issue, in which they favor the party interest above the common interest of the Spanish people. In particular, the “Franco card” you mention is often archaically employed by the historical left, also at a national level, and despite the fact they should fundamentally be against separatist movements (anti-solidarity, economically neo-liberal, with a strong nationalistic component) their rejection to the unity of Spain, (wrongly) defining it as a right-wing notion for historical reason, often preponderates in their position towards this issue. The PSOE party and their double or triple faced approach to this (and other) realities is a perfect example of this. Before making any further conclusions about where Catalonia stands with the Law, I think it’s worth taking into account the opinions of Spanish leaders regarding the Catalan question, over the years. There is a long history of leading representatives of Spanish political opinion that have constantly dished out anti-Catalan sentiment. Is it such a surprise that many Catalans feel very hard done by? And this is how Catalonia is meant to integrate quietly? (“Los catalanes sólo son importantes cuando escriben en castellano”. To B. Gruschenko: I would bet that you live or have lived in Catalonia too… I fully share your perception. Catalonia’s Independence: A Reply… | Brennerbasisdemokratie. Thank you so much Mr. Krisch for such a great piece of writing and thanks for helping in the internationalisation of the Catalan debate. In the current economic, political and moral crisis that Europe is suffering, I want to believe that a new European Union where there is a space for acommodating smaller national realities within its own borders is possible. That’s what the true spirit of European integration should be about. Reading your editorial has been like taking a deep breath of fresh air. let me simply add that forgiveness is not the only argument using Franco regime cannot be possibly accepted as an excuse to justify secession. It is too often forgotten that the Spanish civil war was not a war between regions but a war between ideologies, where Spaniards of all regions were slaughtered by their neighbors. Franco’s repression against Catalans in the 40s and the 50s may have been severe but not worse than that against Spaniards of all regions who had actively fought against Franco. If anything, Franco’s planned economy was particularly benign to Catalonia and the Basque Country, which explains the higher income per capita of those regions even today. P.L.Q. makes two points that I want to respond to. First: “Franco’s repression against Catalans in the 40s and the 50s may have been severe but not worse than that against Spaniards of all regions who had actively fought against Franco.” It has often been observed (correctly) that the “non-Castilians” in Spain suffered a “double-dictatorship”: the repression of their political rights, but also the repression of their cultures and languages (this second type of repression was not suffered in other parts of Spain, let’s not forget that). Second: “If anything, Franco’s planned economy was particularly benign to Catalonia and the Basque Country, which explains the higher income per capita of those regions even today.” What is the original source of that idea? The “great” “historian” Pío Moa? Federico Jiménez Losantos? Any economic historian knows that Catalonia and the Basque Country developed their industry before Franco (for a long time they were the only regions in Spain that had had an actual industrial revolution). In the case of Catalonia, its distinct entrepreneurial, more diversified economy (distinct from Madrid’s, which directly benefited from being at the core of the imperial government), date back centuries. The works of David Ringrose (UC San Diego) or Jan de Vries (UC Berkeley) explain just that. Although Nico Krisch’s excellent response to Dr. Weiler ( http://www.ejiltalk.org/catalonias-indepence-a-reply-to-joseph-weiler/ ) makes this contribution rather redundant, I would like to respond to an anonymous (why, for Heaven’s sake? What are you frightened of?) writer above, “P.L.Q.” who says that “It is too often forgotten that the Spanish civil war was not a war between regions but a war between ideologies, where Spaniards of all regions were slaughtered by their neighbors”. Was it not indeed BOTH? Was not the Spanish right viscerally against Catalan, Basque and Galician autonomy in the 1930’s? Wasn’t it a rightwing leader, José Calvo Sotelo, that said “Antes roja que rota”, shortly being cruelly assassinated, the event that sparked off the army uprising 4 or 5 days later) against the, wait for it, leftist Spanish government? If I may parahprase Berta Badia’s comment that “That’s what the true spirit of European integration should be about”, it is sad to have to acknowledge that the “true spirit of Spanish integration” has consistently and unfortunately been to try and legitimize the annexation to Castile (following the 1714 defeat) of Catalonia, and similar processes of colonization of other territories that had previously shared the monarch with Castile, but not much else (not currency, tariffs, legislation, institutions, civil law, or in some cases language, etc.). 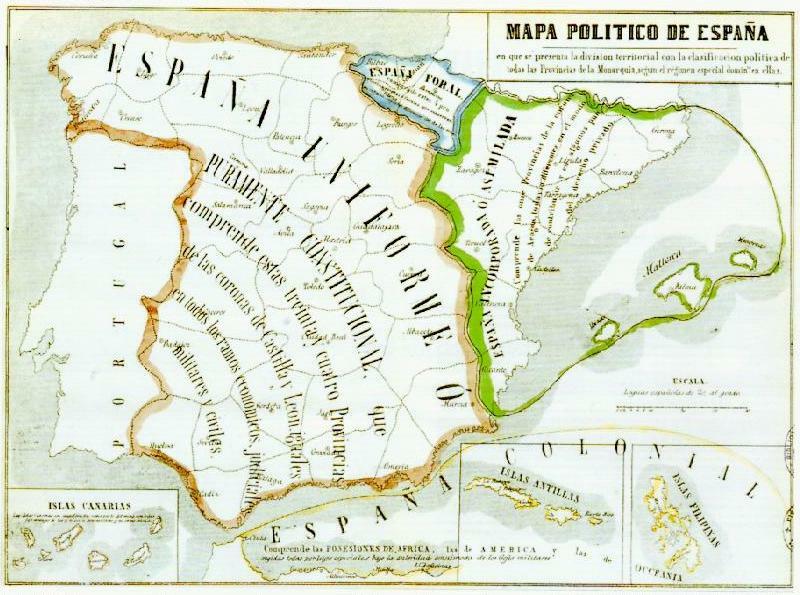 The 1854 school map of Spain is particularly illuminating: http://mapas.owje.com/img/Mapa-Politico-de-Espana-1854-4049.jpg . Here you can see Catalonia and the whole of the former kingdom of Aragon described as “España incorporada o asimilada”. The failure of Spain as a project has been not to get rid of this ultimate aim. Prejudice and stereotypes continue to portray the Catalans as deviants, as “bad” Spaniards. Franco didn’t invent anything: he was just rather more ruthless than those before him and, as we can see, some of those who have succeeded him. The level of threats being hurled daily at the Catalan people are simply not acceptable in 21st century Europe, I mean it. If the English (or Belgian, or Canadian) head of the Transplants organisation said it would be “difficult” to supply organs for transplants to a seceding territory, I doubt they would last five minutes in their job. But Catalan-bashing in a tolerated sport in Spain’s still antiquated discourse. Catalan nationalists have lots of lists about real or imagined grievances the “Spanish” did against the “Catalans”. There is even one on the Catalan Wikipedia, ready for consumption. What they don’t tell you is that you could find just the same or worse about Catalans insulting Spaniards. “Putos espanyols (lladres)” has become a standard comment in Catalonia. If the contrary was true in Madrid, we would never hear the end of it. Or should I mention all the Catalan “intellectuals” treating Castilians and Andalusians *literally* as an inferior species? Pompeu Gener anyone? Nationalists are very fast at being offended, and, as good narcissists, never think it possible that it could be a reaction to their own previous actions. Every time I have investigated if one the grievances is true, I have found a complete different story, different from the one I had been told. I’ll just put one as example: the terrible hunt against Catalan done by the francoist government. It is true that there was some persecution on the first few years and that you had to learn in Castilian at school, but it is also true that Catalan language had never before been so productive as under Franco. You don’t believe me? Read it yourself. Another interesting reading is Habíamos ganado la guerra, by Esther Tusquets, who makes it clear that there were quite a few Catalans that “had won the war”. I suggest you take every one of the points so readily exposed in the posts above and study the context and the sources (and not just the Catalan ones). See how many of them hold water afterwards. The comments to this and the other post on Catalan independence are now closed, since the discussion seems to have run its course.